What can TFC expect in 2011? With non-stop talk of all things ‘Total’ for the last two weeks, it clearly became time to revisit one of the best football books out there. Aron Winter’s appointment as head coach of Toronto FC opened the floodgate of assumptions and speculation as to what supporters are going to see at BMO Field in 2011 and beyond. If one wants to get a handle on what all this 4-3-3, Total Football, and attractive attacking jargon that is being thrown around means exactly, Winner’s Brilliant Orange is without a doubt the source to consult. While reading a book on the history of Dutch football certainly won’t give one a definitive prediction of what to expect or what will be witnessed, Brilliant Orange will deliver not just Toronto FC supporters, but anyone who loves unabashed, attacking football, a comprehensive back-story and explanation on one of the world’s most popular styles in the game. Winner sets out to not just run through a who’s who and chronology of dates and events surrounding the history of football in the Netherlands, but most importantly the why this style exists. Although written before the 2010 World Cup, the questions and what is uncovered is still relevant – specifically why is it that a country that has produced a litany of the best players ever to step on a pitch, continue to fail at winning a World Cup? Before the question of the ultimate prize can be asked, the backdrop must be set. Winner lays out a distinct tipping point in Dutch history where they went from a very sleepy monochromatic culture, to pushing the boundaries as one of the most progressive countries in the world. The same is presented for their football, as even though the game became professional during the 1950s, well into the late 60s, despite clubs being professional, many were still at the standards of the amateur level. Dutch National Football and culture exploded during the late 60s, early 70s in Holland, resulting in a generation of players who would forge one of the best club and international sides the world had seen. Led by Johan Cruyff, Sjaak Swart, Piet Keizer and most importantly coached by Rinus Michels, these players would make up the core of an Ajax Amsterdam team that revolutionized the game and introduced the world to the idea of Total Football. What makes Winner’s story so thorough is that through his explanation of what makes up this team and more importantly the system that they employed is that he is able to not only give the history of where it came from, but also the psychology. A system, that in it’s simplest terms, requires flexibility, efficiency and conservation, is a direct reflection of the territory and land in which the Dutch inhabit. Sitting below sea-level, for centuries it has been a constant battle against nature and finding the most efficient way to maximize a small amount of space. Transplant that into 115 yards by 74 yards and you have a starting point for how it begins to unfold on the pitch. Taking a look at Dutch culture today, but also through the last thirty years of art, architecture and even politics, Winner weaves in and out of the mindset of the Netherlands and how it applies to football. Specifically, a deep rooted ideal that they would rather lose brilliantly than win ugly, an ideal that was put to the test in South Africa this past summer. It is through this story that one could begin to connect some dots as to what could be on display in Toronto for 2011. Winter was brought through an Ajax system that was headed by the man who some say created Total Football, Johan Cruyff, who was then followed up by the one responsible for refining and modifying it for a more modern era, Louis Van Gaal. Whether he in fact implements a 4-3-3 will be seen soon enough, but one would also be wise to add in that Winter spent the majority of his time playing at Lazio under Dino Zoff, seven years in Serie A, and not to mention being born in Suriname, who have more ties to Brazil than Europe as a whole. With an attempt at trying to find a vision and determine what exactly Toronto FC means, implementing the philosophies of the Netherlands and more specifically Ajax will certainly be more compelling than what supporters have witnessed for the past four seasons. 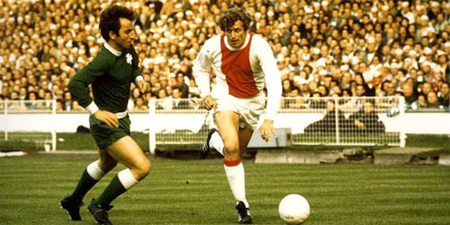 In trying to get a handle on what exactly this will entail or resemble, going through the history of Dutch football – from Ajax of the early 70s, their two World Cup Finals in ’74 and ’78, winning the Euros in ’88, Ajax’s renaissance in the mid-90s to the turn of the century - David Winner is able to give almost every bit of information one would need to fully understand not just what happened, but why. From this, the expression, although cliché, of “you don’t know where you’re going unless you know where you’ve been”, is more than enough of a reason to either look into Brilliant Orange, or pick it up again. Whether you’re from Toronto, a Barcelona fan, Dutch supporter, of just enjoy watching 4-3-3 football, this is arguably the best resource telling the story behind one of the world’s favourite brand of the beautiful game.